Buen dia!!! linda con esa ropa..me re encanto la camisa verde combinado con tu short!! besos hermosa..buen final de semana!! wow! such a fabulous look. Love the green on the leopard on the green. leopards are so perfect with camel and green colours! Your color combinations are always lovely. This is a perfect fall ensemble. Loving how you paired colour with leopard! Aww…so beautiful!This outfit is absolutely perfect! Ohhh I’m impressed how those two colors match each others!Love it! Loveeee the colour combination!!! You look so classy – as always! Gorgeous look and so well styled…the colors, the textures, that shot of green! Glam luxe for everyday…love it! Such a perfect color combination! Picking out a color palette really is an art. I love your suede shorts and bracelets. great outfit!!!! i love your sweater!!!!!! I really love the outfit especially the scarf. Que casualidad! vi unos short así en bershka y no me imaginaba con que ponérmelos ahora en invierno y este post me ha venido muy bien! I love this color combination. Kisses. I love these colors, it’s a perfect mix. Your sweater and your bag are so lovely. What a great outfit ! Love your shorts !!! Beautiful this post! you look great. Skip to visit me I always enjoy reading your comments .. I ask you to adhere to the collection of signatures against GREEN HILL ​​(an American company located in Italy) and run experiments on beagle dogs, torture them and kill them. Help me stop them please! Your shorts are gorgeous! The combination of colors is great! What a great outfit. I wish I had your shorts. that pop of green looks amazing with those neutrals!! there’s something about green that always lights up any outfit.. stick to green from now and then.. suits you! Que buen look! Me encanta la camisa! You always have the greatest idea in terms of color combination! I love the green shirt with those camel shorts! You always inspire me!! I love this outfit! I like the browny tones and then that pop of green! I love your leopard scarf, it’s the perfect accent to this outfit!! I love your mix!!!! the outfit is gorgeous as always, and I love the shorts and tights look! you look stunning. you have a beautiful figure. :) loving the scarf. Thank you very much for all these great comments! Love this! Especially that scarf. Amazing blog dear! i cant get enough of your style. following! This is an amazing colour combination :) I love your shirt and scarf! I love the unusual combination of colors! you look so amazing, that I need to stay here! amazing outfit!!!! i love your scarf!!!! Thank you! :D Your blog is amazing. beautiful outfit! i love the colors. Lovely shirt!! It may be really comfortable!! And it colour is great! I love that green! Shorts are so cute too! Well great job! teh colour combination is great! So it´s perfect that you created your outfit around that! Goodness, I want your bag and scarf! Love the shorts, such a great color! I love how u combie the green with that animal-print scarf! Thanks for the comment! you look great in this outfit! Amaaaazing! A great style! i follow u right now! Great colors and great look!!! I love leopard print + green!! Veronica! You look gorgeous lady! I love the bold mix of the green with the leopard! Great look! I love those shorts and the boots! Love the colour combination! Amazing outfit. Your leopard print scarf is lovely, I love the green and the brown shorts! i just bought a similar pair of shorts and have been struggling with how to pair them. the jewel tone green blouse is perfect- and i can’t resist anything leopard. this look is gorgeous and statement making! I love the color combination! Very inspiring! And leopard is always trendy…..
this combination of leopard and blu-green is just gorgeous…love it!! My dear Veronica: another GREAT outfit, so well combined! Can I have that scarf please???? You know how much I admire your sense of style, your beauty, and I am 100% sure your brains(I can see that you are an intelegent woman!!! ).I was really sick this weekend, it is good to see nice images and get back to the daily routine. Many kisses from sunny Greece!!! wow I love it! the shorts are so stunning! 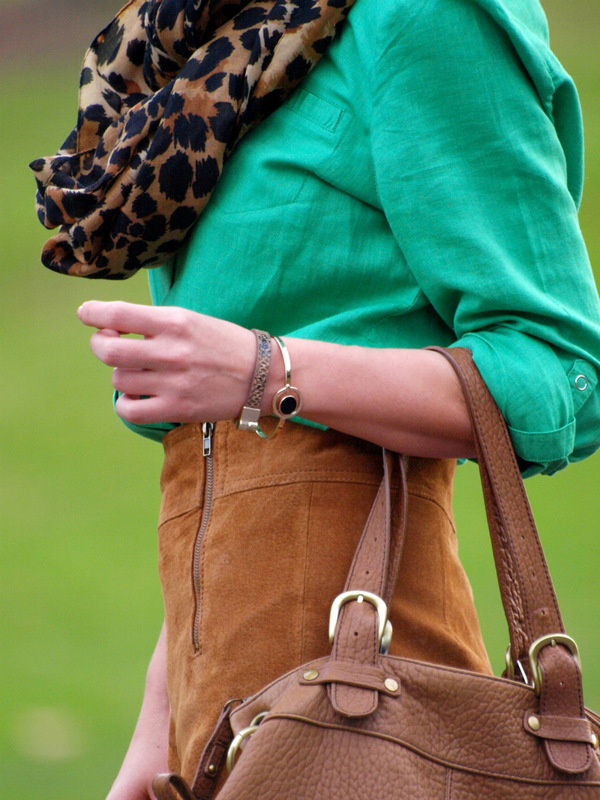 I love this bright green shirt with the leopard print! Great blog – following now! Love the colour combo, honey. You look stunning in that bright green top ! I totally love this look! You are really stylish. Absolutely love the bag! Love the colors of this outfit, great shorts and bag ! The green definitely makes the outfit pop ! This outfit has the best mix of colors and textures and prints. Super freaking beautiful. You look amazing! Love the color combo! Hello Veronica your looks is so cute..
Print de color is beautiful. you look gorgeous as usual. I’m following you, return love back? uoou you look fantastic!!! perfect outfit!!! Everything about this look is perfect! 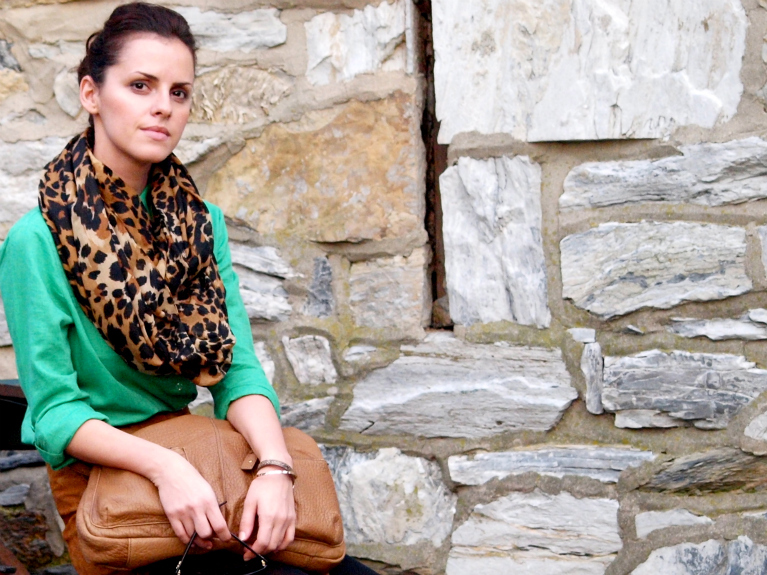 I absolutely love the leopard scarf & green top together! I find it hard to blv you have any hard time putting these colors together, you always exhibit the best palletes! The green looks amazing with the camel shorts! You always inspire me with your outfits! I save a lot of your pictures!! Your so gorgeous! I love that outfit. I have that scarf and absolutely love it.